Empezamos con los vídeos sobre física, hoy nos entretenemos en plantear qué problema gordo tiene el multiverso. ¿Podemos hacer predicciones en un contexto con infinitos universos posibles? El objetivo del vídeo es hablar del problema de definir probabilidades en un multiverso, para profundizar en lo que se va comentando a lo largo de la exposición dejaré unas referencias ilustrativas. Concepto de multiverso: Multiverso… ¿Multi… qué? Sobre la interpretación de los muchos mundos de la mecánica cuántica: ¡Cuántos Mundos! Dividir infinito por infinito puede dar cualquier cosa: ¿Y si divido infinito entre infinito? Del blog de Mati, una profesora muy particular, por Clara Grima. El texto original fue escrito en inglés y así aparece en esta entrada. Por si alguno de nuestros lectores no acostumbra a leer en dicho idioma podrán encontrar la traducción (aprobada por el autor) más abajo. Disfrutadla. The man lives in a large and cold universe but he doesn’t know it. All he knows about is his small world, made of small and warm things. Every morning he wolves his cereals and wonders at the delicious taste of coffee. At work he has no boss, he is surrounded by young people who reminds him of his own youth, somewhat distant already, but not yet remote. He has friends, and values them, as he values the liquid space, where, everyday, freedom is counted in laps. His small universe includes a piano, a book of poems and a chess board. His small universe expands into shared evenings with his wife, and brightens with the laugh of his children. And yet, this tiny, shiny place where he lives is part of a quantum universe. A quantum universe is a probabilistic space. The wave function of all the particles contained in it expands and collapses, expands and collapses, incessantly. In a quantum universe a drop of poisson may or may not kill a cat, but it can also keep it in a mixed state, an undecided limbo. 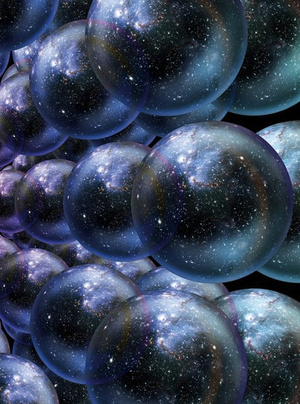 A quantum universe exists, like a bubble in a boiling caldron in a mess of quantum universes that realise all possibilities, each one of them corresponding to a given value of the wave function. There are infinite such places. Most of them devoid of matter, almost all of them empty of life. And yet, some will be inhabited by angels and unicorns, dragons and chimeras, giant butterflies and talking flowers. There are no end and no limit to the power of the combinatorial machine, but is there a meaning? Is there a quantum God? Nor even the gnostics managed to imagine a more hapless divinity. A man lives in a quantum universe and doesn’t know, all he knows is that he is happy. He would not have met his wife, had his children, swim at noon, enjoy his physics, his chess, his poetry if the wave function would have turned up different. But because the cards came right, he pretends he can keep playing them for ever, repeating, repeating, repeating, the beat of his lucky days. But fluctuations do come, inevitably, since he lives in a quantum universe. And a medical test that should have been negative, gives the wrong result. No one takes it seriously, the doctor waves it away, wife’s intuition dismisses it. Yet, he has to run another test in the morrow. And in one of the universes the test will come, indeed, negative, and the man will forget the whole scary episode and rush back to his happy, simple life. But in another bubble in the caldron, the test will reveal something. And this something will be benign in some quantum bubbles, and malign in some others. And that malign thing will be treatable for some configurations of the waveform, but in some others every attempt will fail. And even when the result of the test comes negative, and the doctor smiles, and wife says I told you, he knows. Even when he walks back home and every sun ray in his skin is a gift, he knows. Even when suddenly all the colours of his life shine brighter than ever, the yellow of the banana that he eats as if ambrosia, the orange of the juice that tastes as hydromiel, the white and black of the chess pieces, silver and obsidian in his eyes, he knows. He knows, is all a moment, a bubble, a fluctuation. He knows, that, like Schrödinger cat, he is dead and alive at the same time. He ponders at the miracle for a while, then he thanks the poor, quantum, hapless God and forgets the whole affair and goes on living. Llevábamos tiempo buscando un hueco para escribir sobre la interpretación de los mundos múltiples de la mecánica cuántica. El empujón final la hemos recibido del amino @Jesús Díaz, esperamos que sea de vuestro interés. Es muy bueno, antes de entrar en esta interpretación, leer la entrada “El problema de la mecánica cuántica“. La hipótesis del multiverso no es algo que los físicos se hayan sacado de la manga, aunque como era de esperar ha encendido y provocado malentendidos por el mal uso que le han dado los nuevos “profetas” de la física y el misticismo. Este concepto aparece de manera natural en muchos contextos y con diversas motivaciones. El caso es comprobar si se puede comprobar esta hipótesis en un sentido u en otro. Hoy mismo hemos visto en Ciencia Kanija una noticia referente con este tema, de hecho ha sido la inspiración para esta entrada. Luego le dedicaremos unas palabras a estos artículos. En esta entrada pretendemos mostrar las distintas formas de llegar a este concepto de multiverso en una perspectiva cosmológica.